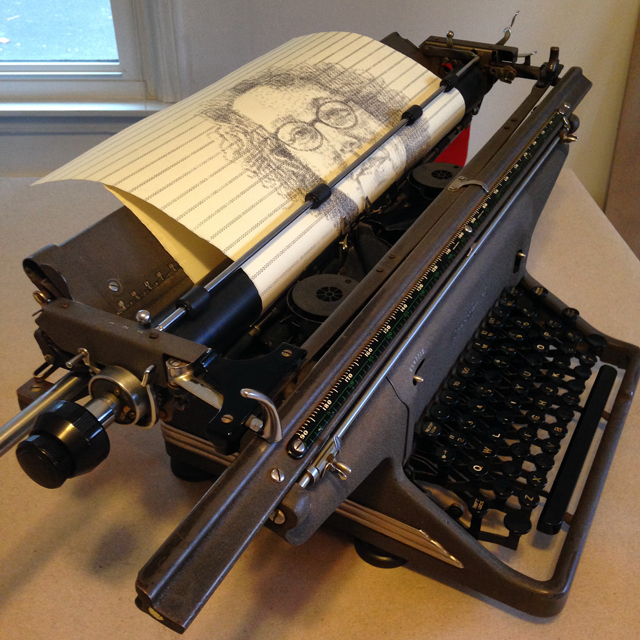 My primary medium is a manual typewriter, which I use to create text-based works on paper. I use the genre of portraiture to create images about identity. For me, the inclusion of text in portraits alludes to the idea that our lives are the creations of our minds and how we identify ourselves and label others is a product of social construction. In the ongoing series Textual Portraits I present images of women emerging from historical texts. A woman’s image emerges from the chosen text, just as she emerges as a person in a specific time and place. Encounters with individual women provide a connection to a classic text related to the social and historical context of the sitter’s concerns or persona. The women are students, visual artists, and creative writers. The texts originate mainly from United States and address various facets of women’s rights. My training as an artist has influenced my appreciation for well-crafted visual work that is rooted in an exploration of materials. I consider how the formal qualities relate to the content I develop. The content of my work and the conceptual framework I use is influenced by my education in gender and women studies. I have come to understand how consistently showing up and “being in the studio” develops individual pieces and bodies of work. Most of my practice takes place in a traditional studio setting. The first step in my process is usually outside the studio meeting and photographing people. These photographs along with the text I choose are the primary materials I use to compose my work. When I use appropriated texts, more traditional research with books, libraries, and computers is required, all outside the studio. In April of 2015, I will be the Artist-in-Residence at Zion National Park in Utah. In this role, I will use the tools and language of my studio practice to visually depict people who value wilderness and “make” Zion National Park. I will research the social and historical relationship between people and the park. I have found that creating connections to communities is invaluable in sustaining my energy to create work and I am excited to delve into this residency. On a practical note, I never envisioned myself as a public speaker. I am surprised how the process of writing about and presenting my work in lecture format helps clarify and enrich my work. When do you find is the best time to make art? Do you set aside a specific time every day or do you have to work whenever time allows? I thrive in routine. For the past several months I have been working in the studio full time and I have found a beautiful rhythm. I am in the studio 4 or 5 days a week and I do office work on Wednesdays or in the evenings. I am most productive in the mornings. After waking, coffee, and breakfast I head straight to the studio. I break up my time in the studio with lunch and a long walk. Walking is a wonderful way to process what is happening in the studio and refresh myself for productivity. 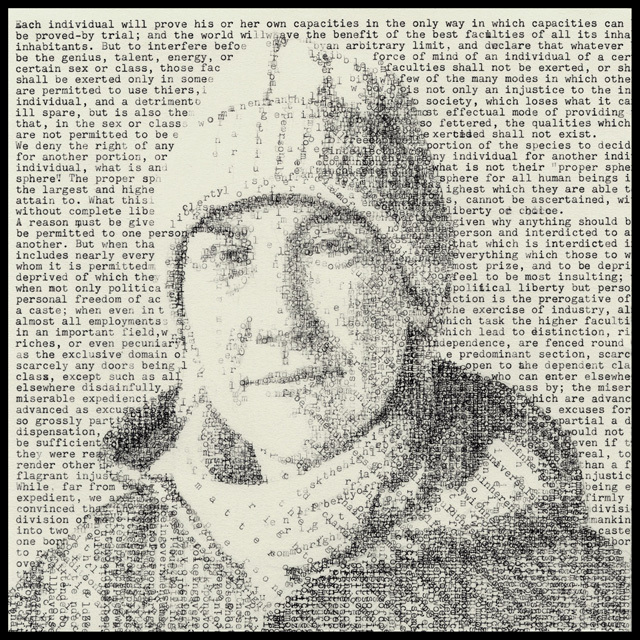 I began the series Textual Portraits five years ago and it has become an ongoing project. Some of the work I am doing now is the maturing fruit of that series. I am using the same techniques with much more fluidity, and the ideas have become more nuanced and clear. I have found that it is essential to cultivate a community to engage with my work, especially living in the rural mid-South of the United States. One of the most sustaining relationships that I participate in is with two other artists, Yvonne Petkus and Kristina Arnold. We meet at each other’s studios once a month. These studio visits elevate the expectations I set for my work and are an outlet to engage with other artists’ practices in a meaningful way. In 2013, I earned a master’s degree in social responsibility and sustainable communities with an emphasis in gender and women’s studies from Western Kentucky University. The teachers, writers, activists, and ideas I encountered in that program have greatly impacted the framework with which I think about and create work. In Textual Portraits I appropriate some of the texts that have impacted my thinking. I have wide-ranging interests, but select passions and pursuits. I was pulled towards being an artist at an early age and no other pursuit has equaled visual art’s gravity. I love hiking. My dream is to live in an awe-inspiring environment where hiking can be a part of my daily studio routine. Born and raised in St Louis, Missouri, Leslie Nichols currently maintains her studio in Bowling Green, Kentucky. 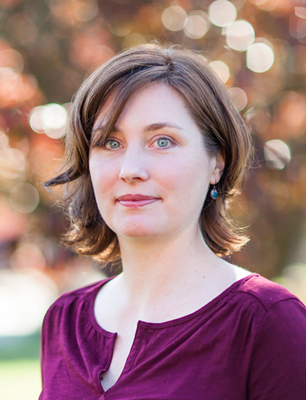 She received a BFA from Fontbonne University (2001), where she focused on painting and drawing, and an MA in Social Responsibility and Sustainable Communities from Western Kentucky University (2013), where her research focused on gender and women’s studies. Nichols uses a variety of found and original text to create images. 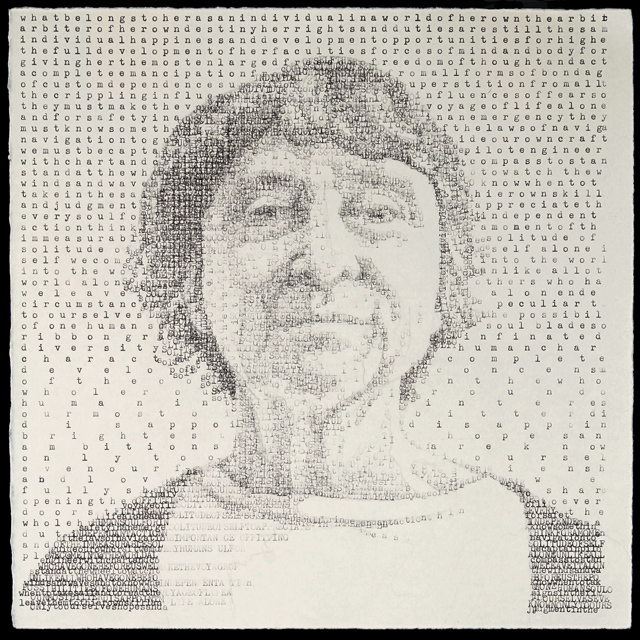 She is most well known for her works created on manual typewriters which are featured in Typewriter Art: A Modern Anthology published by Laurence King. 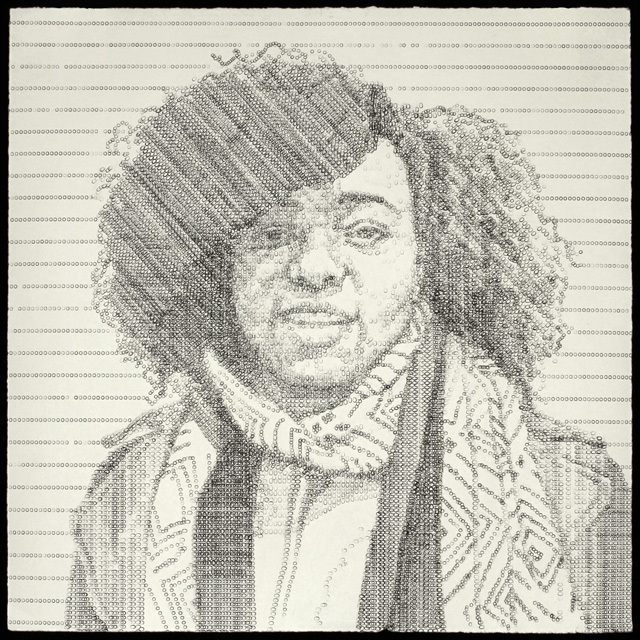 Nichols is the recipient of several grants and awards and most recently was awarded a 2015 NEA Studio Residency Grant from Women’s Studio Workshop. This grant will support her creation of a new body of work in WSW’s letterpress studio. Additional granting institutions include the Elizabeth Greenshields Foundation, the American Association of University Women, and the Kentucky Foundation for Women. Her residencies include Zion National Park, Vermont Studio Center, Hopscotch House, and Can Serrat. This entry was posted in Drawing, Works on Paper and tagged Drawing, Kentucky artist, typewriter art, women in art, works on paper. Bookmark the permalink.